Corso, A., Jansen, J. & Kókay, Sz., 2014. A review of the identification criteria and variability of the Slender-billed Curlew. British Birds 107: 339-370. 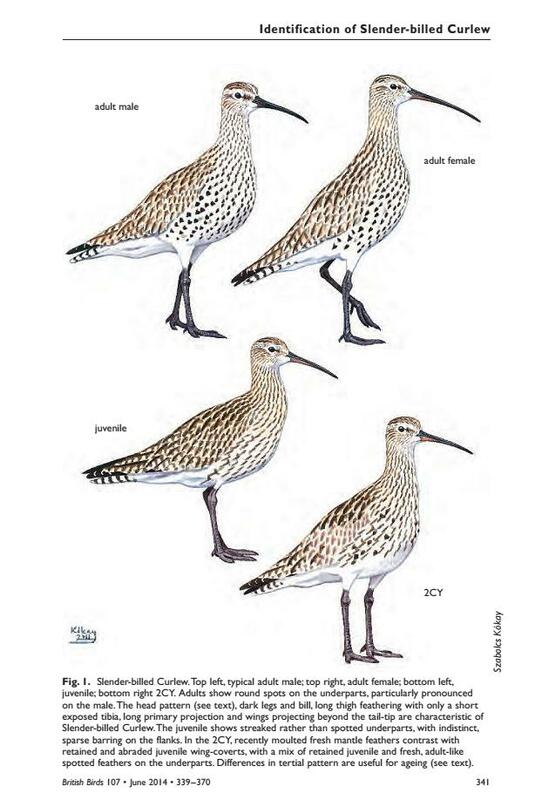 This paper presents a complete review of all proposed identification characters for the Slender-billed Curlew Numenius tenuirostris. The review is based primarily on examination of museum specimens, but also on photographs of live birds. All characters were examined from scratch, so the analysis provides a revalidation of some criteria while challenging others. The most useful features for the identification of Slender-billed Curlew were found to be: the colour and pattern of the underside of the outer primaries; pattern and extent of the tibial feathering and length of exposed tibia; leg colour; pattern of the tail feathers; and shape of the dark flank markings. All other proposed features were found to overlap to some extent with some Eurasian Curlews N. arquata. Since the mid 1990s, when the species was seen on the last-known regular wintering grounds, in Morocco, curlews showing characters associated with Slender-billed Curlew have been reported from several countries, including England, Greece, Hungary, Italy and Spain. These reports have generated considerable and ongoing debate and this paper should provide a key baseline for any future reviews. This entry was posted in North Africa and tagged identification, Numenius tenuirostris, rare birds, Slender-billed Curlew. Bookmark the permalink.